The I-joists and plated trusses appeared in the late 60’s and early 70’s to challenge widespread methods and standards. But it wouldn’t be until 1990 that a light, trimmable, and more practical alternative would appear thanks to the invention of the finger jointed open web floor truss. So from steel framing to using concrete or engineered wood, architects nowadays are taking advantage of the different characteristics of each material to combine them in unique creations. And thankfully, it is possible to make all these materials work together. In multi-residential construction, you’ll see steel being combined with wood because of its load bearing capability. It is also appreciated for its compactness, when compared to wood beams. Steel is also gaining in popularity in single home construction. Municipalities have now adopted regulations that allow steel beams to be used in residential construction, and architects are using them to great effect to create stunningly large spaces with minimum support, for example, in lodge type housing. Steel can also allow large open spaces in basements (in the event that engineered wood joists cannot span the great open space). In some instances, steel beams are needed to provide support for large decks. Because of their different properties, an extremely important aspect of combining wood and steel is the quality of the connections. Following manufacturer instructions is essential to the safety and durability of the assembly. So, for the purpose of this article, let’s focus on wood to steel connections. More precisely, we will explain how to combine a steel beam with the TRIFORCE® open joist. 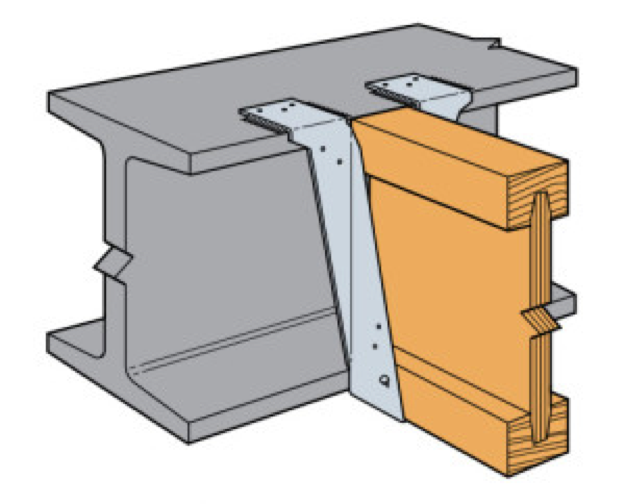 As illustrated here, steel beams with wood filler require top mount or face mount hangers to attach to the TRIFORCE® open joist. The use of top mount hangers can be done in certain conditions. As per those examples below, you can use a wood sill plate fix to the steel beam and fix the hangers to that sill plate supporting the joists. Always make sure that you follow the hanger manufacturer’s specifications and requirements. It’s also possible to join steel and wood mainly through the hangers. 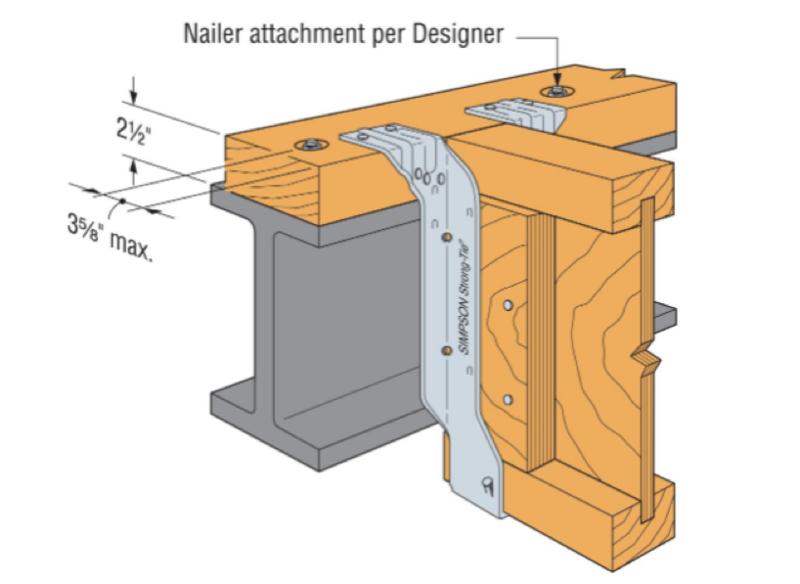 Below is an illustration of the use of weldable hangers, in situations where it isn’t possible to use wood filler on the steel beam. Here’s another type of attachment, using a steel beam with wood filler fixed only to the top and bottom flanges. It doesn’t need a bottom flange-bearing hanger as you can cut away the trimmable end of the open joist TRIFORCE® at an angle, to achieve the support. Again, taking extra care when making these connections will ensure your structure is strong and long-lasting. These are just a few examples that demonstrate how versatile the TRIFORCE® open joist is. Our solution offers architects and builders new opportunities to seamlessly integrate an environmentally friendly component to their projects. Besides, TRIFORCE® allows for more creative constructions, large open spaces, and safer structures thanks to its unique properties. If you would like more information on wood to steel connections, download our Spec Guide. In addition, if you are using TRIFORCE® open joist and are unsure about your wood to steel connection, please contact our team — we’ll be happy to help. Joining Barette Structural in 1999, Jean-Sébastien has a degree in building design, as well as having studied environmental design and architecture. He’s been involved in TRIFORCE® floor design ever since its origins as the Open Joist 2000®. In this blog, he’ll be sharing practical tips thanks to his vast hands-on experience supporting countless TRIFORCE® customers and industry partners.